To solve the crime, Honora is drawn into Stargazer City's seedy underworld of black magic, dark charms, and devious witches. She'll have to watch her back with the new club or she might end up in a place worse than death. The other Mayhem sisters are stirring up trouble of their own. When the Willow Realm police ask for Vivi's help in finding a missing witch, her worst fears are realized—she sees nothing, no witch, no body, no future. And seeing nothing is never good in the world of prophecy. Out in the Meadowlands, Clover, for once fresh out of writing ideas, goes in search of some excitement—a true crime story about an illustrious jewel thief targeting Stargazer City's elite. Clover hopes to track down the thief with a proposition to turn literary informant and tell her tale to all of Everland. The Mayhem witches are at it again using their wits, their persuasions, and their family devotion to track down a killer, find a missing witch, and catch a jewel thief. 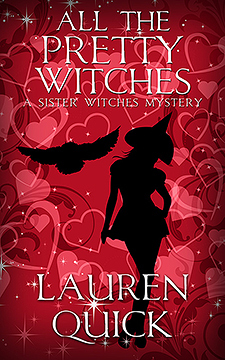 Mayhem is stirring in All the Pretty Witches, a paranormal mystery that takes you to new depths of dark magic.